Instructional Designers need a wide variety of skills today to meet the demands presented by the myriad of available delivery options. But while the focus is often about effective usage of the hottest new tools and technologies, there is one skill that is often forgotten. While some may think that the era of texting and IM’ing have lessened the need for perfect prose, the opposite is true. Because people are now scanning text more than reading it, there has never been a more urgent need for clear and concise writing. 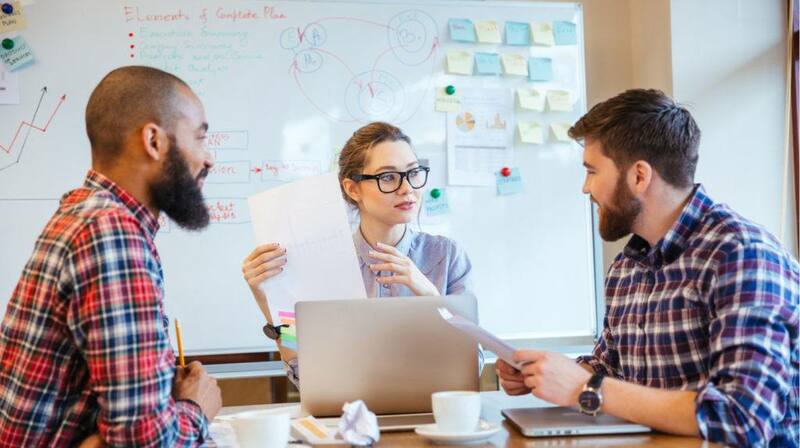 One solution that may help is to take a few principles from the world of Technical Writing, where writing skills are paramount to job success. Here are 6 technical writing tips that can make you a better Instructional Designer. What is it? Separating your information into small, easy-to-read and understand "chunks". Why do I need it? The human brain is much better at understanding and remembering information that is organized into small and meaningful chunks. In many ways, this is the most obvious rule of good Instructional Design, yet it is one of the most overlooked. Information mapping, a popular methodology followed by many technical writing groups, was founded on the principle of “chunking,” which was based on a cognitive memory study by George A. Miller in the mid-1950s. Miller’s study found that the human brain has difficulty memorizing information that has more than 7 (plus or minus 2) elements and that our brains "chunk" the information in order to remember it. Interestingly, Miller subsequently worked with Bell Labs, which is how the U.S. phone number system became 7-digit numbers chunked into a 3-digits followed by 4-digits. Here’s an example of how chunking might work when building a course. Identify only 3 to 5 major skills or objectives for the learner to attain by the end of the course. Then determine the subsets of each objective and list those in order of importance. You will also want to limit the number of sub-categories. Review the material. If there are too many subsets of information, learners won’t remember it, so pare the material to only the chunks of information most relevant to meeting the course goal. Any more than that will make it difficult for learners to succeed. What is it? Using words and sentences that a 12-year old can understand. Why do I need it? If you show off by using college-level writing style and vocabulary, it will be more difficult for learners to understand the topic that you’re teaching them. Research tells us that the average American reads at a 7th or 8th-grade level, so why would you write about your subject with vocabulary aimed at the college level? This is especially true when writing about complex topics. Don’t let your learners struggle with the vocabulary while they are already struggling with the topic! Use the reverse pyramid of journalistic style: present the most important information first, followed by less and less important details and supporting information. Edit your writing; if it’s possible to cut out a word, you should cut it out. MS Word can also offer some help. If you can convert your lesson to MS Word, navigate to Options > Proofing, enable readability statistics, then run spell check. At the end of the spell check, a readability statistics window displays, showing the percent of passive sentences, a Flesch reading ease, a Flesch-Kincaid grade level, and more. What is it? A clear, concise, and direct way of specifying who or what is initiating an action. Why do I need it? It is more concise, easier to understand, and better for translation to foreign languages. With active voice, the person or thing performing the action of the verb should be the grammatical subject. In passive voice, the receiver of the action is the grammatical subject. 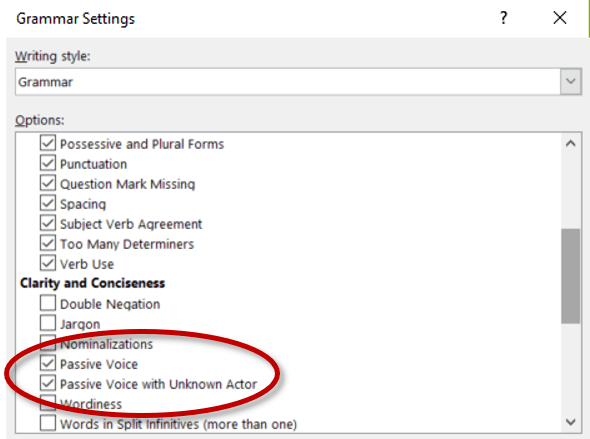 Passive Voice: "The options are displayed in the Settings dialog window." Active Voice: "The Settings dialog window displays the options." Active Voice: "Tech Support programmed my phone." In short, active voice is more concise and direct, has a stronger tone, and is easier to read and understand. Just as importantly, sentences in active voice are shorter than passive voice. Long, compound sentences are great in soupy novels, but for Instructional Design, short is beautiful. Navigate to Options > Proofing. Ensure that Check grammar with spelling is checked. Select the Grammar Settings button and enable the Passive Voice checkboxes are enabled, then run spell check. What is it? A concise way to specify who or what is initiating an action. One of the most common ways that people make text longer than needed is to write it in the future tense. Does this sound familiar? To complete this operation, you will click the I Agree button and then close the window. To complete this operation, click the I Agree button and close the window. What is it? A set of standards that ensure your lessons use consistent terms and phrases throughout. Why do I need it? Learners will find it easier to understand consistent terminology and writing conventions. Why doesn’t your organization use a style guide? Most likely, it’s because there’s never enough time or expertise to build a comprehensive style guide. However, your style guide already exists, but you’re simply not using it! There are several excellent style guides to choose as your base style guide, then, if needed, you can create a page or two of exceptions for your particular environment. For example, the Microsoft Manual of Style covers just about every grammar and style rule that you can think of - and not only rules for computer terminology! If you don’t like their recommendation to use one of their terms, then write your preferred term in your short list of exceptions. Or if you want a style guide that is not industry-specific, Elements of Style from Strunk & White and the Chicago Manual of Style are excellent choices that have survived the test of time. What is it? Reviewing your content for the writing elements – and ONLY the writing elements. Why do I need it? It allows you to focus on your writing style and consistency of the writing presentation. The writing style of your lesson does not have to be a primary concern as you are developing your content, but it is extremely important to check it from start to finish before you declare your project complete. Here are some ways that technical writers accomplish this. Make a deal with a peer; you’ll proofread their work if they’ll proofread yours. Add proofreading as a formal step in your course development methodology. If you think others will scoff at the idea, then call it production prep work, but put it on the schedule, and do it! Just about all authoring tools allow you to add words to your spell-check dictionary. When you see squiggly lines under terms that are not in your dictionary, right-click and select 'Add to Dictionary'. That will make the final step in your development effort go much faster. Of course. Avoid potential embarrassment and be sure to spell check one last time before you go live.